Off to Bend and Sausalito! Mac Daddy. 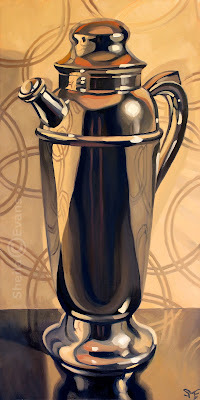 Oil on panel, 30" x 15". Time to pack them bags! 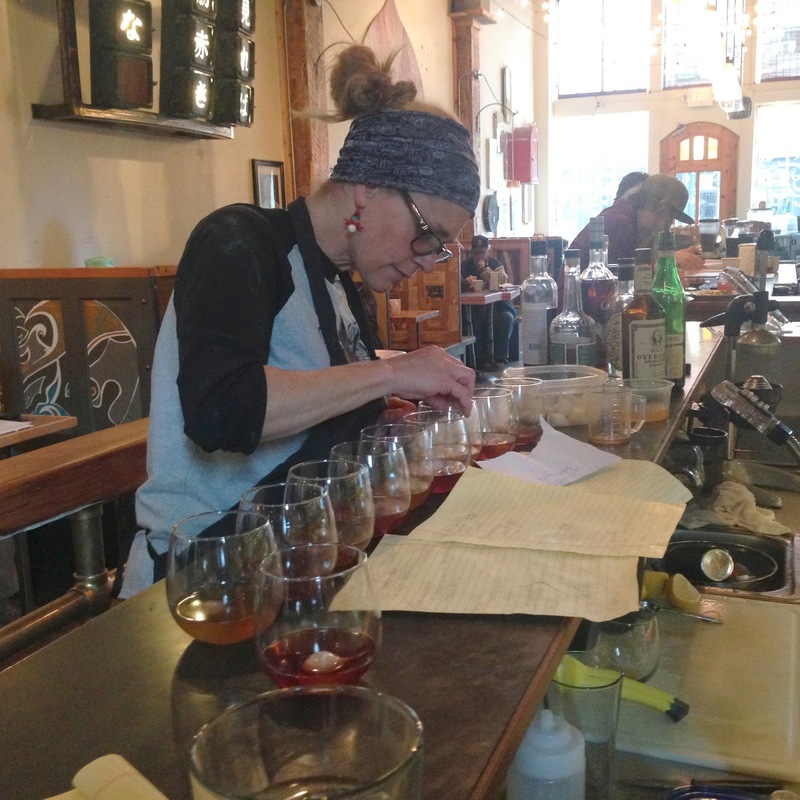 Mixology makes its debut at two major west coast art festivals in the next few weeks. This weekend, it's Art in the High Desert in Bend, Oregon. This is a lovely, well-juried little show along the river in Bend's Old Mill District. I've taken a few years off from the show and am excited to return with all new work. Then on Labor Day weekend, it's off to the Sausalito Art Festival, a giant party of a show that never fails to be fun. I did this one last year with pastels, and couldn't wait to try it with Mixology. I've made several new, bigger paintings for the shows including Mac Daddy, above, and Shake it Up and Stir it Up, below. Each is 15" x 30". For show dates and hours please see my Shows and Events page. Wabi Sabi. Oil on panel, 8" x 8". The best day at the Bellevue Arts Museum Artsfair was the day before the Bellevue Arts Museum Artsfair. Paul and I set up in record time, then took off to try the Seattle cocktail recommendations of several friends. One place everyone agreed on was Liberty on Seattle's Capitol Hill. This low-key neighborhood bar and sushi stop turned out to be the single friendliest spot I have visited. 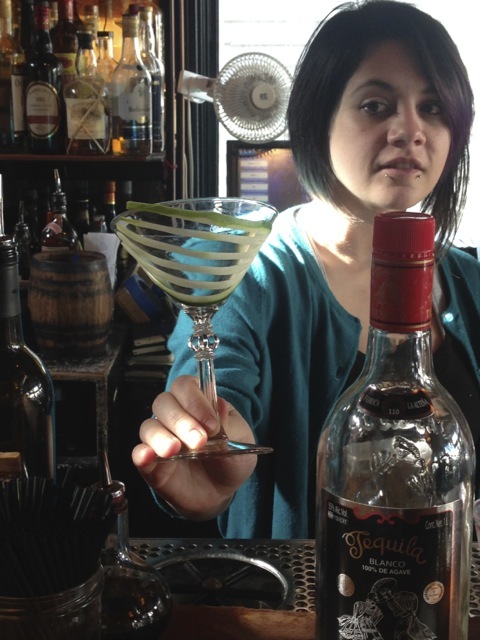 In one evening, we came away with five recipes from two different bartenders, Willi and Laura. Willi served us first, and that experience gets its own future blog post (once I do his drinks justice!). As we left for an art exhibit, he introduced us to Laura Bishop. Laura, herself an artist, liked the idea of the book project and wanted to contribute, so we promised to return. Upon our arrival back at Liberty, Laura served three original drinks, all beautifully garnished (apparently the Liberty custom—more on that later). The first, the Wabi Sabi, combined green-tea-infused gin with lemon, simple and thyme for a fresh, summery taste that I instantly loved. Laura was so helpful and all of her drinks so delicious, I plan to include at least one more of them in the book. Stay tuned! Inspired by the Japanese moniker, I wanted to keep this painting simple. I googled Japanese textiles and found this vintage pattern, which I printed out for a backdrop. I already knew I wanted to use my best-ever-find cut-glass coupes (7 for $5 at a rummage sale! ), so the perfect pairing of cut-glass pattern and bamboo-leaf print was a happy accident. The glass sits on a green-enameled metal wall tile, scavenged years ago from an old school. This brought the bright green color up into the stem and added green reflections to the bowl of the glass, all to tie in with the thyme-sprig garnish. But the real star of the show is the glow of the green tea gin and lemon against the dark background. Mixology With a Twist Art Exhibit and Book Release Party! Looks like I have a date! 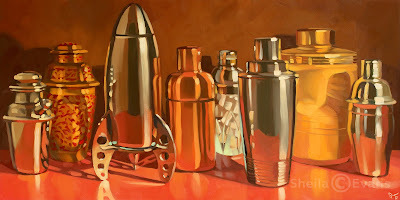 Once again, Mike has graciously offered to host the Mixology release party and art exhibit at Mizuna. I'm so excited to have it on the calendar! Just like last year, the event will be the first Friday in November, from 5 to 10 p.m. 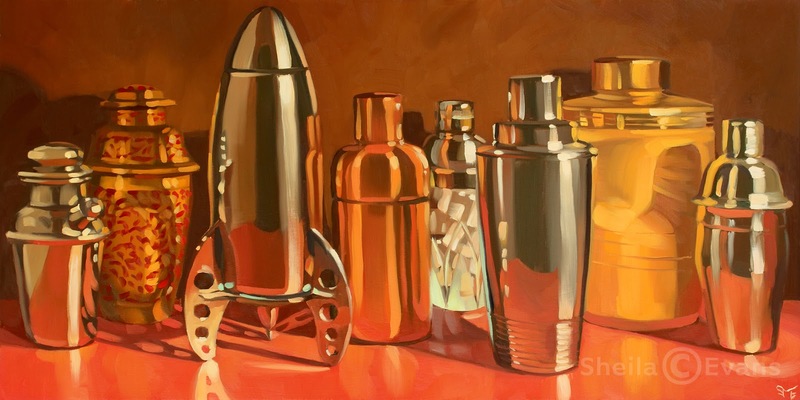 I'll have all the paintings from the book available for purchase, along with, of course, the book, and giclée reproductions and copies of the original Mixology classic cocktails book. There's a ton to do between now and November, though! New drinks to paint, less-than-successful paintings to re-paint, drinks to taste, WRITING, more painting, more writing, more drinking, etc., etc. Oh, and a few art festivals happen somewhere in there. And on that note, I had better get back to work. When: Friday, November 6, 2015, 5–10 p.m. 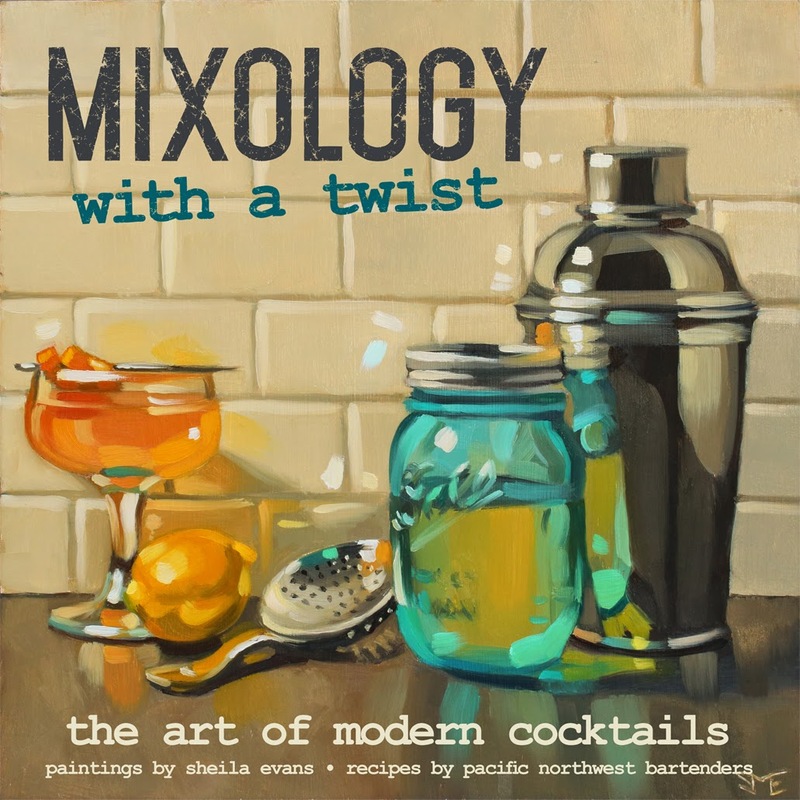 Celebrate the release of my second cocktail art book, featuring original recipes from Pacific Northwest bartenders and cocktail enthusiasts. 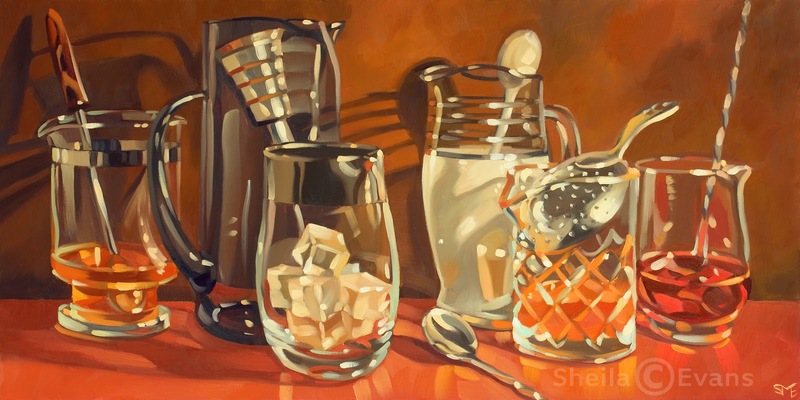 Original paintings from Mixology With a Twist will be on display (and available for purchase) along with books and reproductions of select paintings. Mizuna will offer drink specials from the book along with their delicious food (separate, full vegetarian/vegan menu). Last year's party was a blast, so if you missed it, here's your chance to see what you missed! Artwork will remain at Mizuna through the end of 2015, so if you missed the opening party, please stop by. Many of the original works are now available through my new online store. Sheila's Medicine. Oil on panel, 12" x 12". When I started this new book project, the first person I thought of was Alison Collins, owner of Boots Bakery and Lounge. I had been enjoying her drinks for years at Mizuna, and continued to enjoy them when she opened her own vegan bakery, deli and bar. The complex drink, adorned with a fresh cocktail onion (how did she know I love painting onions?) has an overall sour cherry vibe. This comes from Amargo-Vallet, a bitter liqueur from Mexico, which stars in the drink alongside its sister liqueur, Fernet-Vallet. Other ingredients include gin and a delicious house-made agrodolce (sour and sweet) syrup containing orange peel, ginger and white balsamic vinegar. I made this syrup at home and found that once strained, it leaves a pile of amazing candied orange peel. Bonus! I wanted to capture the feel of the scene I found at Boots the day I tried this recipe. It took me eight months to figure out that I should do what Alison did: put the winning drink in a coupe-ish glass in front of a row of hopefuls. And of course I couldn't resist filling a glass with onions. I love how they reflect back and forth, becoming more colorful with each bounce of the light. Boots has a lot of string lights, so I set some up just above the drinks to reflect on the shiny black "bar" and in the glasses. As I work on this project it's getting more difficult each time to come up with a unique perspective, so I was happy with how different this painting looks from the rest. the perfectly-staged party room at jimgermanbar. Way back in May, a cocktail tasting night ended in the hatching of ambitious group travel plans, as per usual. This time, shockingly, we went through with it and somehow got ten busy people to spend a night in the tiny town of Waitsburg, Washington, at the wonderfully out-of-place jimgermanbar. Jim German, a Seattle artist, uprooted himself to open the bar and eventual restaurant, where he serves creative and artistically-presented original cocktails, "Etruscan Snacks," and if you can put together a group of ten or more people, a reputedly-delicious paella. (It was not vegetarian, so I had to take everyone's word for it, but it smelled and looked amazing). The space is beautifully constructed with custom furniture made from salvaged materials from the previous café, and has a warm, inviting, rustic-modern atmosphere. Original artwork by Jim and friends hangs throughout the two rooms, enhancing the creative atmosphere. Jim's own art studio occupies the rooms above the bar. It was a fantastic night with wonderful drinks, food and company. Jim promised me a recipe for the new book, and I was ecstatic to include it. Both Jim and I being busy people with crazy lives, it took until now to actually get the recipe. Thus the long-time-coming post; I didn't want to tease you with a recipe that didn't happen! *UPDATE: on the subject of teasing, I'm sad to report that jimgermanbar is no longer open. Rumor has it that Jim is up to something good in Walla Walla, so I will try to keep you posted.